With the entrance of 2015, I felt compelled to, yet again, make a resolution to lose weight. In the past, I’ve had moderate success by diet alone, but I’ve usually hit a brick wall eventually, and with a nice bit of sloth, the weight comes back. I’ve also had moderate success with cardio workouts. But as it seems, running and getting up the heart rate doesn’t cut the mustard—or the fat—as it once did. All amateur advice pointed toward strength training. I’ve never been great at any sort of muscle work in the past, but I reckoned that trying at least the basics would be better than nothing—the “basics” in this case were Sit-Ups, Pull-Ups, and Push-Ups. Sit-Ups sounded… painful. Pull-Ups were impractical due to the absence of a bar in the apartment. That left Push-Ups. I could do those. I knew two things before starting: 1) I was crummy keeping on a regular workout schedule; and 2) if I was going to be any good, I’d have to rely on technology. I’ve always responded well to leveraging tech for other habitual behaviors. So with trusty iPhone in hand, I went to the app store to find a Push-Up app. I’ve used DietBet, Tactio’s TargetWeight, and have been playing around with the new iOs Heath app, but wanted to find something along the lines of Couch to 5K, where the app understands that you’re a beginner and need to gradually build up to your goal. My goal was modest: Be able to do a goodly amount of Push-Ups and have something to show for it. 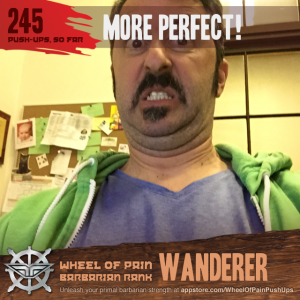 I read a slew of reviews and found some serious contenders, but there was one app that caught my eye: Wheel of Pain Push-Ups. Okay—at least someone understands that maxing out on Push-Ups can be painful. Let’s check this out. 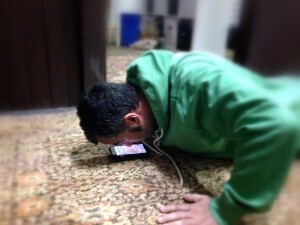 Not only is the Wheel of Pain the most ballsy, heroic, motivating, unique and entertaining push-up app in the world, it’s also the most effective! 10-stage training program based on proven strength training principles for a goal of 102 consecutive push-ups. In-your-face verbal coaching by the vocalist of internationally acclaimed rock band, ArnoCorps, as he counts each rep you perform in real time and provides motivational feedback in a ballsy accent! Fully automated guided workouts. Performance, energy expended, workout durations and best sets are all tracked. Reps are counted using touch screen and sensors. Customizable workout soundtrack and power-up mode that includes five FREE training songs ($5 value) from ArnoCorps. Immersive high adventure barbarian realm interface. Wait. What? 102 consecutive Push-Ups? Okay. I’m game. And a “ballsy accent”? “Barbarian realm interface”? You’ve got my attention. And as a free app, I really have nothing to lose—but weight. Initially, one might perceive ArnoCorps as merely a group of six highly-trained militant Austrian action-rock heroes. Big mistake. The motivation behind the band is far too complex to be defined by such superficial characteristics. With powerful anthems including Terminator, Commando, Predator and Total Recall, the band has been singularly responsible for restoring integrity to the many Austrian tales that have been exploited by nefarious movie moguls for financial and political gain. This means that the Wheel of Pain app has the most balls-to-the-wall, out of control and inspirational workout music you could ever need in one app. 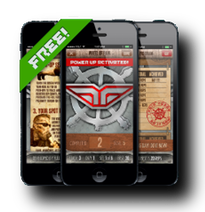 In fact, it is so full of adrenaline and power, it should have two apps. My sizable schnozz counts off another rep. GOOOO!!! So now I’m hearing heavy metal blasting and Holzfeuer berating me to work out. With his Arnoldesque yelling of “GOOOOOOO!!!! !”, you’re instructed to start doing two Push-Ups in a row. The app counts your efforts by making you touch your nose to the phone each time you go down for a rep. Take a 60 second break, then it’s time for 3. Another break, it’s time for 4. Another break, 3 more. Last time—do as many as you can, but do at least 4. During breaks, Holzfeuer as Arnold is telling me to watch my form and telling me I’m doing great. This is not your normal fitness app. Holzfeuer and ArnoCorps are so serious with the attitude and commit so strongly to the Arnold persona, that it’s both hysterical and serious at the same time. The included soundtrack includes songs from the apparently vast library of ArnoCorps albums. I’m not writing to review their music (if I were, it’d be on my personal blog), but the songs both make me chuckle and move me to work out as I were in a work-out montage in an 80’s blockbuster movie, like The Karate Kid, or Rocky XVII. But you can actually add songs from your own iTunes song library, which is pretty sweet. I have yet to do that, even though I have over 15,000 songs in my library because I’m just grooving to ArnoCorps. I’m not sure if the original intention of this app was to attract folks like me to the Power and Glory that is ArnoCorps through the magic of exercise, but if it was: Mission Accomplished. I have a feeling the app was designed as a musical promotion piece, but the band members seem to be very vocal on their Facebook page about being committed to exercise as well as rockin’ out. I don’t normally listen to heavy metal music, but the functionality of this app, its motivating ability to keep me interested in growing my muscles, and the sheer commitment to “Arnolding” makes this app a true winner in my book.